Welcome to the Kopachuck Ridge Estates Homeowners Association Web site. 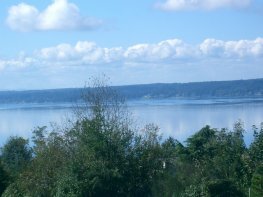 Kopachuck Ridge Estates (KRE) is located in unincorporated Pierce County approximately six miles southwest of the city of Gig Harbor in the state of Washington and a half mile from Kopachuck State Park. The first division was developed in 1986 and the second and third divisions were completed in 1990. There are 76 lots in the development. There are only a few empty lots. Our development is within a quarter of mile of Voyager Elementary and Kopachuck Middle schools. Both of these schools are among the top ranked schools in the State. There is a fire station located within a half mile and three country stores within 3 miles. Many of the homes in the development have views of the Olympic Mountains, Puget Sound and Mt Rainier. We enjoy a rural life with deer, raccoons, squirrels, birds and other wild life in abundance and yet it is a short 20 minute trip to the Tacoma Mall. Gig Harbor has several big name stores such as Home Depot, Target, Costco, Jos A. Bank, Marshalls, Bloom, Chico's, Frankie and others as well as an 11 screen theater and soon an IMAX. There are about 10 coffee shops and 20 salons. If you are into boating, there are several boat ramps and marinas located within the Gig Harbor area. There is one boat ramp about 5 minutes away. Kopachuck Ridge Estates Homeowners Association (KREHA) maintains our roads and common property and keeps an eye out to ensure that all our property owners are following the Protective Covenants. Our Association is very active and has been able to maintain the same standard for the last 25 years. We have many homeowners that have been living here since the development began in 1986. KREHA maintains our private road and storm drain system. Periodically we have our roads surveyed by professional road engineers to ensure that they remain in good condition. KREHA has spent over $250,000 on road and storm drain maintenance since 2006 and has re-paved all our roads. We believe that it is important to perform preventative maintenance early so as to avoid more disruptive and higher cost repair later. All utilities in the area of our development including power,telephone, natural gas and cable are underground. Our private storm drain system consists of over 60 catch basins and two retention ponds. We inspect and clean the catch basins according to a plan developed over several years that allows us to clean a portion of our system every year. Our drain system is fully compliant with Pierce County, State and Federal requirements. The County inspects our drain system on an annual basis. Kopachuck Ridge Estates has an excellent water system managed by the KRE Water District. The system consists of a single well, 133,000 gallons of storage, two fire flow pumps, two distribution pumps, one dual booster pump system, an 80KW emergency generator, distribution pipe, fire hydrants and 82 user connection water meters. Our water quality is second to none. There is no need to treat or chlorinate our water. Water samples are taken monthly to test for microbiological contaminants. Other tests are run annually and others are done according to a schedule set by the State Department of Health. The system meets the requirements of the State Dept of Health which approved our system in 1994. Our system is owned by the KRE Water District that was formed in 1992 through an election process to elect a board of three (resident) commissioners. The system is managed and maintained through a contract with Peninsula Light Co.
Kopachuck Ridge Estates is a wonderful place to live. We all love it.